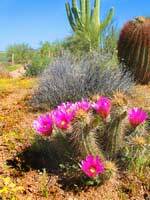 The Sonoran Desert is the most lush and diverse in both plants and animals, of all the world's deserts. 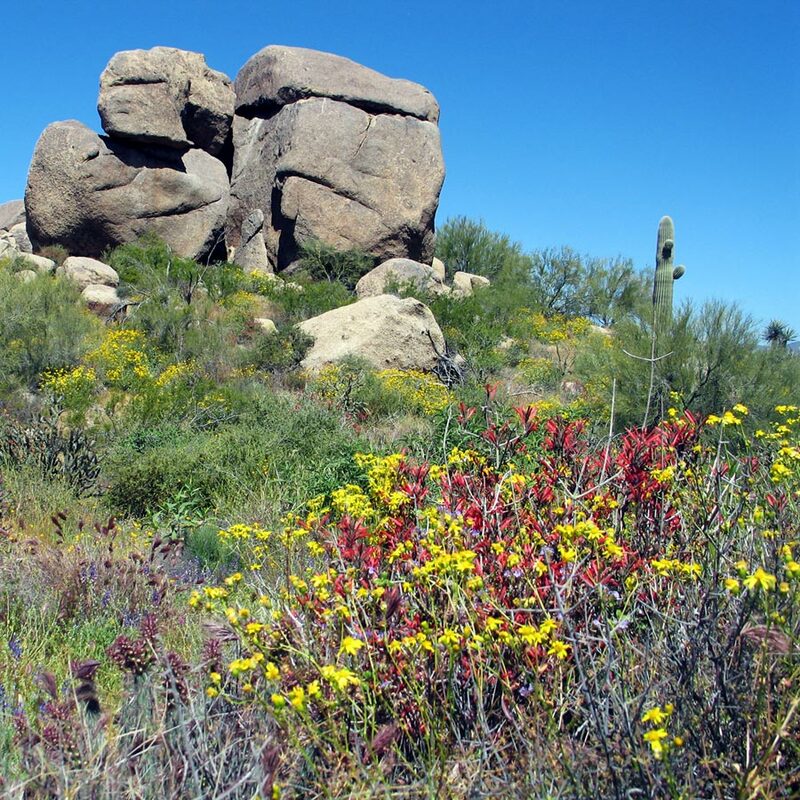 And the Pinnacle Peak area is among the most beautiful areas of the Sonoran desert...with the wealth of fascinating plants, prominent granite outcroppings, boulder landforms and sandy washes that ribbon through the valleys or “bajadas” between rugged mountain ranges. The base elevation of the Pinnacle Peak area is higher than the Valley, which makes it cooler. This is aided as well by less pavement and other heat retaining surfaces like buildings, as this is the most sparsely populated portion of Scottsdale. In fact, we’ve noted that it’s often about eight degrees cooler than central Scottsdale and easily ten degrees cooler than downtown Phoenix. This affects the biodiversity of the area. This desert is also aided by winter storms roll off the Mogollon Rim, which is the uplift area to the north and east. Our summer monsoon rains often come up from Tucson and are a result of orographic lifting in the higher mountains there. What’s more, this area of the Sonoran desert is so visually stunning is the pre-Cambrian granite mountains have eroded into huge granite boulders and unique rock formations in the form of pronounced monoliths like Tom Thumb and Pinnacle Peak. The upper Sonoran desert elevation of Pinnacle Peak, 2,650 at the base and 3,170 at the peak of the Peak, receives more water and is cooler than other Valley areas, which are lower in elevation and often have more heat-absorbing buildings and pavement. I fact, the five to ten degree difference can be felt in a few minutes, when traveling up Alma School in the sweltering summer, you get out of your car and realize it’s cooler than where you just were a few minutes ago. The result of all this is a remarkably rich desert. It may not look like it sometimes as you drive by on a road, but get out for a hike on a trail and you’ll be in wonder at the diversity of plant life and terrain. The desert landscape attracts many common Sonoran Desert bird species such as Gambel’s quail, the iconic roadrunner, white-winged dove, hummingbird, woodpeckers and cactus wren. 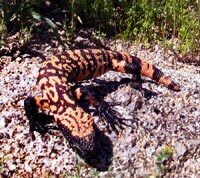 The rocky outcroppings provide habitat for desert lizards, including colorful gila monsters, the desert tortoise and of course, rattlesnakes. Sandy washes provide travel corridors for many mammals, including coyotes, mule deer, bobcats, mountain lions and javelina. Residents usually enjoy seeing little packs of what appear to be desert pigs, snorting through the desert and coyotes lollygagging or ambling down neighborhood streets. Bobcats always create a neighborhood stir, as they are often mistaken for the less common mountain lion. Arizona’s unique raptor, the Harris’s hawk, can be found here. 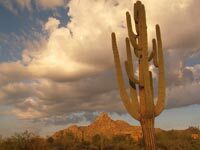 Pinnacle Peak is situated between the northern and southern sections of the extraordinary and ever-expanding McDowell Sonoran Preserve and is accessible in minutes to both areas. A great place for desert discovery with access or everyone, is the Bajada Nature Trail at the the Gateway to the McDowell Sonoran Preserve, near DC Ranch. This interactive desert experience consists of is a wide smooth trail that winds through the desert with exhibits that tell the stories of plant, animal and human life in the Sonoran desert. It takes about a half an hour to walk the route. 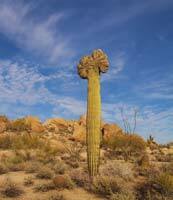 Many desert plants can be seen on the trail, including saguaros, paloverde and mesquite trees, and many varieties of cactus. In March it’s often in bloom with wildflowers. A trail guide is available at the trailhead. Dogs on leashes are allowed and it’s free. Just north of Pinnacle Peak is Brown’s Mountain, in the northern part of the preserve. This mountain and two others in the area are actually extinct volcanic buttes…most people don’t know that Scottsdale has those! 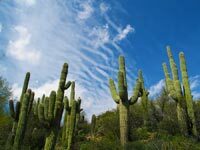 The giant saguaro particularly likes this climate and the result is a landscape richly studded in these arm-twisting marvels.You could spend your entire vacation tracking down great saguaro at sunset photos. 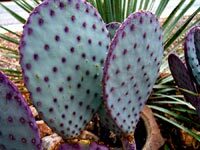 We feel honored here that we “own” this cactus…nowhere else in the world are they found, except for a small portion of northern Mexico, yet they are the “icon” often used to symbolize deserts everywhere, as well as the west. At the northern portion of their range they are more plentiful on the warmer south facing slopes. A few stray plants have been reported in extreme south-eastern California. It always surprises us to see our saguaro on souvenir items in Dallas, Palm Springs or even Santa Fe! Not even close! The sagauro can grow to be 40 feet high and live over two-hundred years. Some of the largest saguaros ever documented can be found in nearby areas around Cave Creek, and there are monster specimens “down the hill” near the Verde River. Everyone loves the saguaro. For one, they really don’t have very aggressive needles, so you can brush by one and not get pinned. In May, they develop little top hats of yellow and white flowers atop buds of fruit. 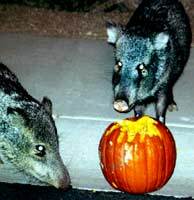 As the season progresses, the fruit turns red and falls to the ground to the joys of jam-loving desert creatures. Saguaros are plentiful in the Pinnacle Peak area, including Pinnacle Peak Park. They are particularly large and dense around Granite Mountain the newly acquired northern portions of the McDowell Sonoran Preserve. 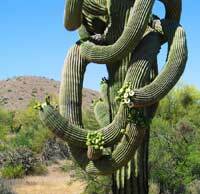 Saguaros are much loved, for they are all different. Their unpredictable arms, which take 75 years before they sprout, make them take on personalities. Some are 40 feet tall, taking 200 years to get there. Their skeleton may remain behind another 100 years. 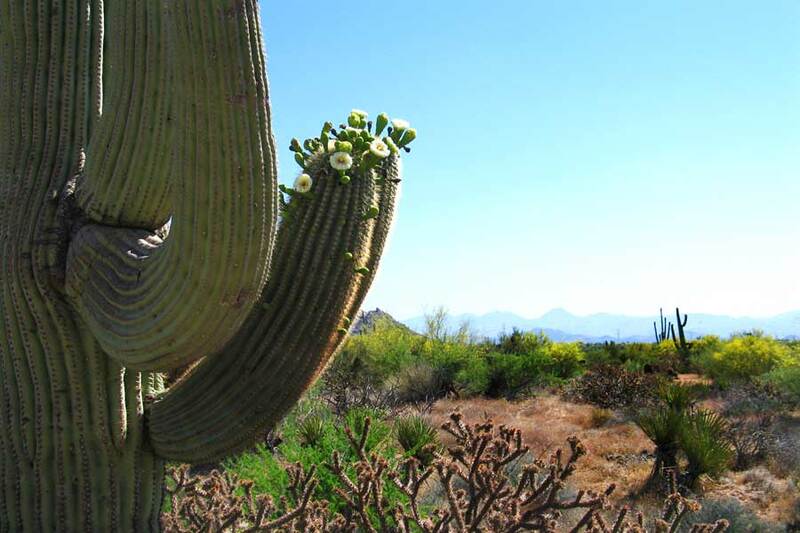 The saguaro blossom is Arizona’s state flower. In May, the saguaro sprouts white and yellow blooms that look like the cactus has put flowery hats on it’s head and arms.The fruit ripens then ripens, splitting open to reveal the bright-red, pulpy flesh which many desert creatures enjoy. This fruit was an important food source to Native Americans of the region. Saguaros are also a favored roost for birds and the ever-pecking woodpeckers around here, who make little holes where elf owls live, although few people ever seen one. Other birds enjoy the holes and the lookouts as well. Photo tips are in order if you are trying to capture the giant saguaro. One of the best ways to take a photo of a saguaro is looking up say from a wash or arroyo to a saguaro that's on the crest above you. Prickly pear, is a decorative plant, but don’t brush up against it’s hairlike needles, they will annoy you until you get a magnifying glass and pluck them out. The most feared of the desert plants is the cholla, or jumping catus. The reason they call it that is that you could swear you didn’t come near it, but her is a bud stuck to your arm. DON’T GRAB IT! You will end up with needles in your grab hand. Instead, it’s best to carry a comb with you for you and if you have a dog. Dogs I’ve heard are funny about this plant….they’ll get into it once, but not so likely again. A comb can flick out the barbed buds and after some painful moments you’ll be good to go. If you’ve ever seen a cholla forest backlit by the sun, it’s a beautiful thing. Appreciate these plants from afar. 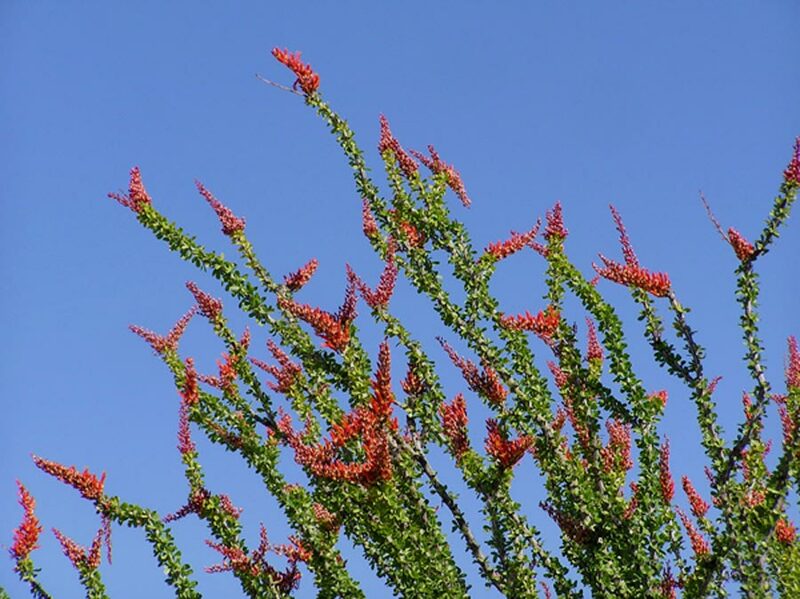 Ocotillos are backyard favorites, as their unique multi cane shape and red blooms add architectural interest to any area. 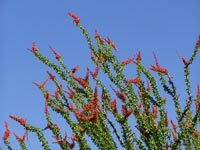 Other prominent cacti that are prevalent in this area are ocotillo which don delightful spindles topped with red fuzz, prickly pear… multi-varied cactus as far as the color of its patents and growth structure and barrel cactus. The most common native trees are the Palo Verde, which blooms gloriously yellow in April, as well as Mesquites, whose beans feed many animals and birds, and the slow-growing gnarled Ironwood. These are the predominant trees that should be planted in anyone’s Pinnacle Peak area yard. Citrus and other non-native trees cause a lot of health problems for people and simply aren’t as appropriate for this area. 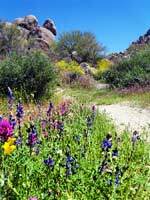 The spring wildflower season begins in late March and goes to mid-April in what can be literally a wild botanical garden in the desert. Due to dry autumns, some years however it doesn’t pan out so well, although there is always somewhere you can find them. There are many online postings to this effect, where you can find out what’s peaking where. The sheltering effects of the rocky outcroppings and wash embankments provide a fairly reliable show of wildflowers following winter rains. Pinnacle Peak Local’s favorite desert creature! 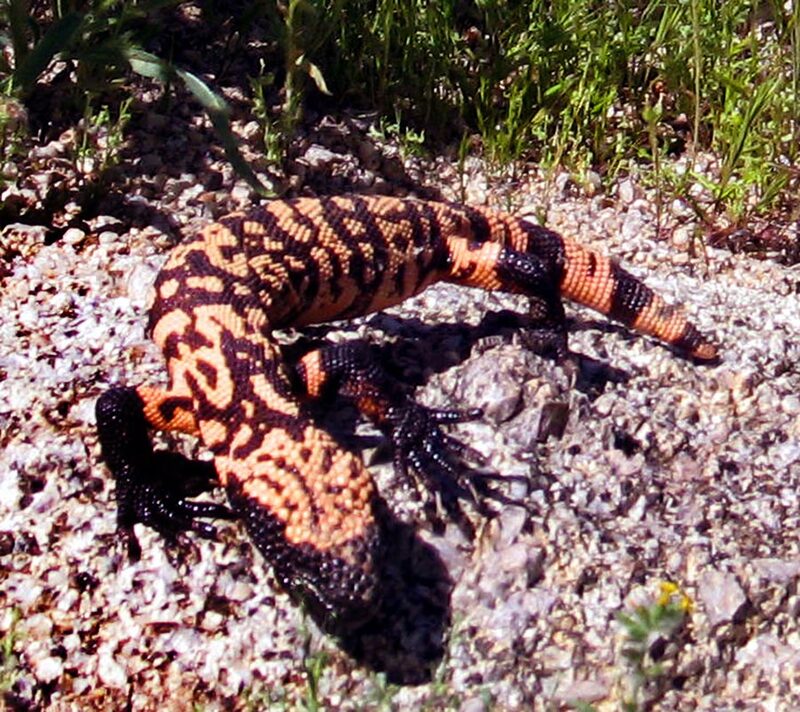 Many native Arizonans have never seen a gila monster in the wild. We’ve have had eight unique experiences, and have photographed seven. 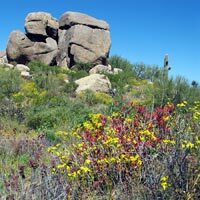 A great resource to learn more about the Pinnacle Peak area is the McDowell Sonoran Conservancy. There are currently McDowell Mountain Conservancy task forces to identify the plant and animal species in the Preserve. 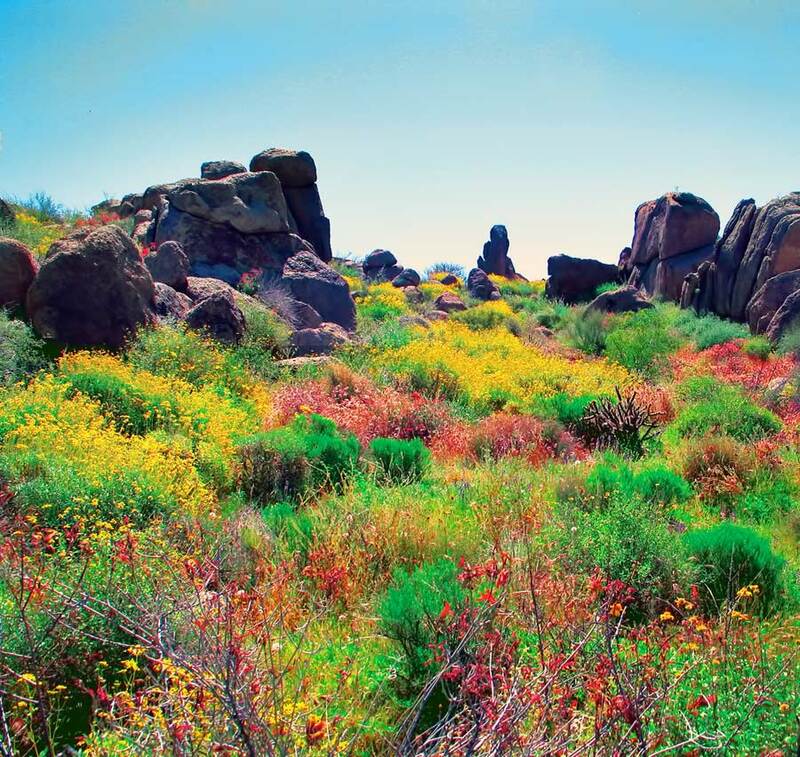 We are grateful to the non-profit McDowell Sonoran Conservancy who “champions the completion and sustainability of the McDowell Sonoran Preserve for the benefit of this and future generations." It's easy to feel the prehistoric energy here of native peoples who once lived in this area, possibly 8000 years ago. Most likely this area had more water in earlier centuries and millennia. The Hohokam had a large permanent village near Pinnacle Peak, unusual in that is was so far from the area’s major rivers like the Salt and Verde. A spring in the McDowell’s provided water and these early settlers subsisted on small mammals like rabbit, occasional larger game… but also mesquite and other seeds, jojoba nuts, cactus fruit and pulp. Fond of boulder outcrops, there is evidence that prehistoric humans occupied the Pinnacle Peak area as far back as 6,000 B.C. and used the outlying rocky encampments for seasonal hunting and gathering and processing of wild plants. 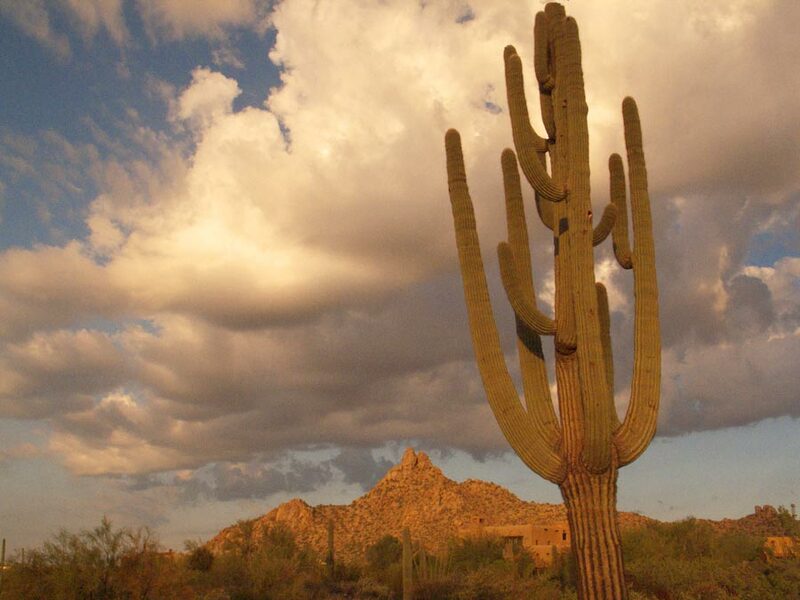 the Pinnacle Peak area is amongst the most beautiful areas of the Sonoran desert.